One Mission Bay is a unique, luxury condominium development in one of San Francisco’s fastest-growing, most desirable neighborhoods. For those that haven’t yet made a visit to the sales center or the Mission Bay neighborhood to see why they’re so special, we’re bringing the sales team to the blog to share their thoughts. Kevin Gibbons, Senior Sales Manager at One Mission Bay, grew up in Northern Virginia and has been living in Southern California for the past 20 years. Kevin and his family moved to the Bay Area earlier this year when the opportunity arose to work with the fantastic team at One Mission Bay. 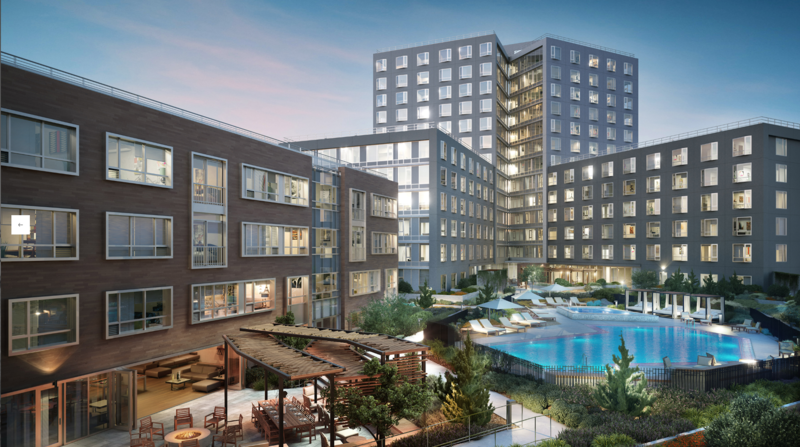 Intrigued by this groundbreaking development and all that the Bay Area has to offer, Kevin was thrilled to join the One Mission Bay team and see this incredible property come to life. 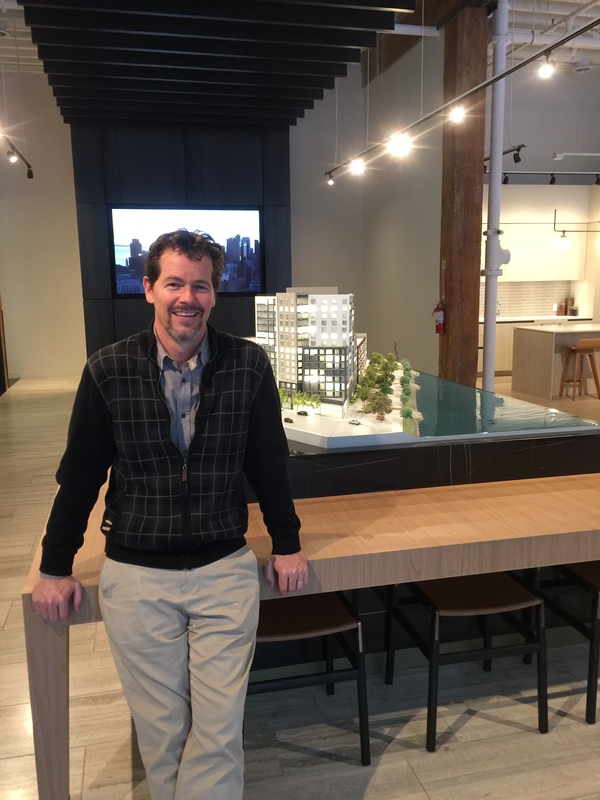 Kevin was kind enough to take a few minutes out of his busy schedule to share his thoughts on the special features of One Mission Bay, his favorite parts of the neighborhood, and his advice for prospective buyers. What do you think buyers will enjoy most about One Mission Bay? The location. We have over 600 feet of waterfront property, with a park running along the water, and being able to take advantage of the indoor/outdoor active lifestyle in San Francisco is key. You’ll be able to walk to a concert or game at AT&T Park, and see the Warriors when the new arena comes to town. You can get in and out of the city easily via so many modes of transportation, from CalTrain and Muni, to the future Central Subway and proposed expanded Ferry service. The amenities and lifestyle of the One Mission Bay community will be very much like a luxury resort. Just going downstairs and getting in the pool or hot tub, sitting by the fire on the pool deck, or having a bite to eat in the Club Lounge—having that at your disposal is very unique. Describe One Mission Bay in 3 words. Why do you think the Mission Bay neighborhood has become so popular? Mission Bay, because it’s a relatively newly-developed area, has a bright future. It’s the home to not only UCSF now, but the new Uber headquarters, the upcoming Warriors arena, the planned Mission Rock Development, and the new boutique Marriott Hotel that will be directly adjacent to the development. I think people are attracted to the future, and there’s a real excitement that Mission Bay will have a prominent place in the future of San Francisco. Where would you spend your free time: Fitness Center or Catering kitchen? I think the question should be: where would I enjoy spending more time! I would enjoy spending more time in the catering kitchen, but realistically I’d probably be in the fitness center, working on staying in shape. The catering kitchen is going to be beautiful—it’s a lounge and dining area where residents can reserve space for a special dinner with guests. There is a professional kitchen with appliances by Gaggenau, a gorgeous fireplace, and a long beautiful table—which make for a really nice setting. The fitness center was designed by Harley Pasternak, who is a celebrity fitness trainer down in L.A., where I used to live. It is a large space right off the pool deck, so you can be inspired by looking out onto the pool and work a little harder! How do you commute to OMB? I live in the East Bay with my family, so I use Fast Trak and drive to Mission Bay over the Bay Bridge each day. I had about the same length commute in L.A., but this is so much prettier. I’m driving over this gorgeous bridge and looking onto the Bay, and can sometimes see the Golden Gate Bridge and Alcatraz. It’s an exciting, beautiful city, so coming in and out is something I look forward to. What would be your activity of choice in the Mission Bay neighborhood? If I lived at One Mission Bay, I would rent a kayak and paddle out into McCovey Cove. I would dock somewhere out in Mission Bay and have a picnic on the shore—I think that would be fun! The neighborhood has beautiful water settings, with views of great architectural gems like the Bay Bridge, and lots of great activities; and this is a huge reason why so many people love Mission Bay and the Bay Area. What do you make sure people see when they visit One Mission Bay for the first time? We give people a tour of our sales gallery, which has model kitchens and bathrooms, detailed architectural floorplans, renderings, and videos. After coming in to the sales gallery and getting a deep understanding of what’s available and where things are within the building, buyers can walk down along the water and start to see the building come to life. They can get a real sense of what it will feel like coming home to this property. What would be your one piece of advice for prospective buyers? Try to get in early. You’ll have more choices!